Introducing the EfficientGrip from Goodyear, the tyre choice for reduced fuel consumption without reducing other performances. It has the great handling and braking qualities you'd expect from a Goodyear tyre, while providing excellent mileage and reduced fuel consumption due to its outstanding rolling resistance. The new EfficientGrip with its FuelSaving Technology provides enhanced driving performance while also doing its bit for the environment - and at the same time, your wallet! The Goodyear EfficientGrip has been independently tested by the German Testing and Certification Company TÜV SÜD Automotive which measured the advantages* of EfficientGrip over 4 leading competitors. The EfficientGrip is the long-lasting tyre that saves you fuel without sacrificing performance. Fuel-saving and environmentally friendly. Save on petrol and leave a smaller carbon footprint with the EfficientGrip, featuring FuelSaving Technology. Combining a lightweight structure with an advanced tread compound, the EfficientGrip needs less energy to make it roll. The result is lower fuel costs – and CO2 emissions – on every journey. Eco-friendly performance The EfficientGrip tyre uses Goodyear's FuelSaving technology to help you reduce your carbon footprint on the road. 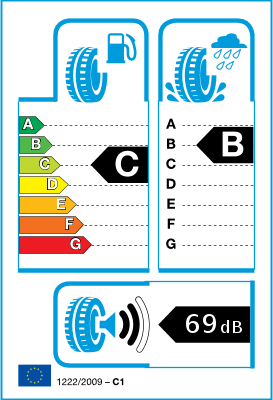 The tyre uses less energy overall due to its light structure and specially designed silica tread compound, which means you can save on fuel – and do your part for the environment – all from the comfort of your car. Smooth and comfortable Enjoy a smooth, comfortable ride on every journey thanks to EfficientGrip's block design, which cancels out excess noise for a more pleasant driving experience. Durable and long lasting The EfficientGrip's tread is made with a tough silica compound that helps it work harder for longer, so you can get in more Eco-friendly performance The mileage before having to change the tyre. Long lasting. The EfficientGrip gives you more mileage between tyre changes. Its silica tread compound keeps the tyre working for longer, saving you money. Quiet, comfortable ride. Enjoy comfortable journeys thanks to the noise-reducing block design. *Compared to the average performance of 4 leading competitors. 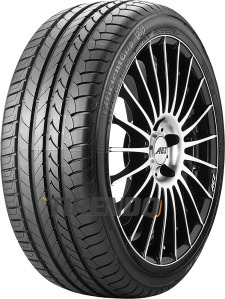 Tested by TÜV SÜD Automotive in March 2009, Tire Size: 205/55R16, Test Car: VW Golf, Report #76236753. ***Rims and complete wheels are excluded from the free delivery (9.90 EURO per wheel / rim).